Keen on trying a chicken and shark bone soup? 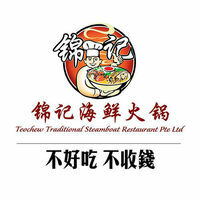 Then Teochew Traditional Steamboat Restaurant is the place to go. A wide array of seafood and meat fill the menu. Be sure to have a taste of their fish kway teow as it is their signature steamboat dish. Photos of celebrities from Hong Kong, Taiwan and Singapore who have all eaten at the restaurant decorate the walls of the restaurant. Located at 269 – 271 Outram Road, this restaurant deserves a visit for their unique take on a classic dish.